In case you too were wondering where youa��ve heard it before, Put Chutney on Harleya��s Road shares its name (and nothing more) with a group that creates memes that are going viral on Facebook. a�?I left my IT job and started The Cake Point in Ambattur in 2010, and now have eight outlets,a�? says Balaji Chinni, one of the partners, explaining that the name was just a reference to the South Indian habit of asking for more chutney at restaurants. Chinni is joined by a silent partner, Pramod Balaji, and the owner of Jennat Foods that operates the Bombaysthan chain, Immrran Raja. 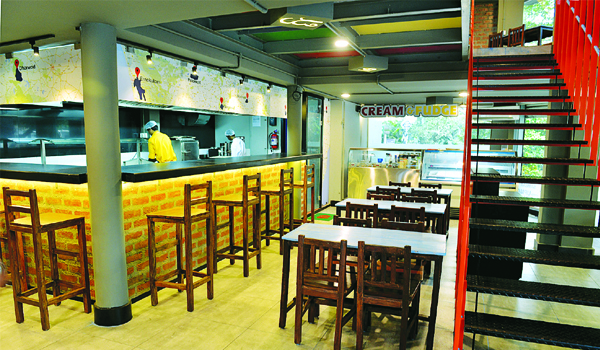 With an open kitchen and simple wooden furniture, Put Chutney can accommodate 60 across two floors. a�?We want to revive South Indian dishes that are not commonly available today. Like Kancheepuram idlis and akki roti. The vegetarian bread omelette that my grandmother used to make using gram flour is also part of our menu,a�? Chinni shares, as we try their aapam with creamy coconut milk. The Kancheepuram idlis, made in larger moulds, are dotted with roughly-ground black lentils, pepper, curry leaves, cumin and mustard. Our favourite, though, is the open dosa topped with potato curry and spicy gunpowder. a�?We make our own podis (gunpowder),a�? says Chinni, adding, a�?They are made by chefs from Andhra Pradesh. Our head chef used to work for Mathsya and he has chefs from Madurai, Tiruchirappalli and Tirunelveli working with him.a�?